I ordered this pretty much right after seeing The Force Awakens and I couldn't be more pleased. 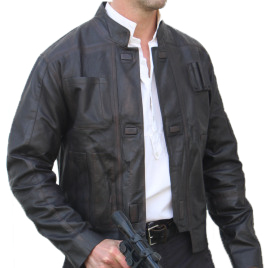 High quality jacket and from what I can tell, accurate to the movie. Leather feels really nice and the weight, drape and cut are all very good. I've been a customer for years, so the measurements are on file. Fit is really nice. There are lower cost replicas out there, but my advice is spend the money for something like this. You'll get a jacket you can wear forever. And at some point paying too little for something is going to show. The price here is for a custom, very well made leather jacket. Highly recommended! I ordered the dark brown pre distressed lambskin. I have a lambskin jacket from 10 years ago and the wear and distress on that is quite close to the movie jacket. I think it's the best option.